Our challenge training weekend is designed to help you prepare both physically and mentally for any challenge. We run two training weekends one in the heart of Snowdonia North Wales where we climb Mt Snowdon and other is The Brecon Beacons National Park South Wales, with departures all year round. Staying in Hostel accommodation we will spend two days trekking covering all aspects of what to expect during your challenge or expedition, the weekend is also a great way to meet fellow trekkers. We can also arrange bespoke dates should non of the above dates suit you. The easiest way to book your trip is online via the website, simply click Date and Availability, You will need to pay a non-refundable deposit of £75.00 at the time of booking. 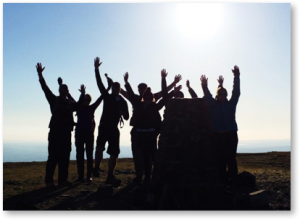 It is possible to reserve a place on this challenge by email to info@adventurousewe.co.uk, however you will need to pay your deposit of £75.00 to confirm your place on this trek together with completing a booking form. Friday evening will be a welcome evening with a briefing for the weekend ahead. Saturday morning we will go through equipment then head off to climb Snowdon or the Brecon Beacons National Park. The route chosen will depend upon the weather conditions and the trek which the group will be undertaking overseas, Saturday evening we will head for the pub and cover any questions the group may have concerning their challenge. Sunday morning we will leave the hostel with our packed lunches and trek for half the day finishing around 2pm, Today will be a great opportunity to ask any questions about your challenge, camping tips,high altitude, kit and medical advice and any issues the group wish to raise.